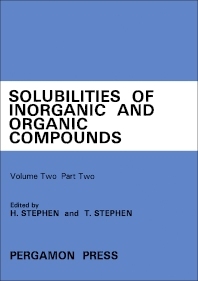 Solubilities of Inorganic and Organic Compounds, Volume 2: Ternary and Multicomponent Systems, Part 2 presents the solubility data of ternary and multicomponent systems. The text arranges the data in a way that the first Tables are systems in which an Element is a component, which are followed by data for systems containing inorganic compounds, metallo-organic compounds. Next, the selection presents the systems in which water is one component and the remaining components being organic. The book will be of great use to students of chemistry and chemical engineering.